As a comedian of the 1940s and 1950s he demonstrated his ad-libbing skills in his weekly radio show Ray's A Laugh from 1949 until 1961. A music hall comedian, Ray usually played violin badly as part of his act - first as Hugh Neek, then "Nedlo the Gypsy Violinist". He also played comedy roles in several British films notably as the headmaster in Carry On Teacher. 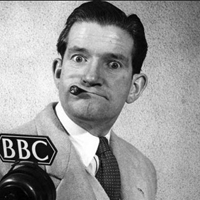 He is best remembered for the Sunday lunchtime radio show Ray's a Laugh, a domestic comedy in which Kitty Bluett played his wife. Other actors and actresses who featured on the show included Peter Sellers, Fred Yule, Patricia Hayes, Kenneth Connor, Pat Coombs and Graham Stark; Sellers' earliest appearances predated The Goon Show by a couple of years. In 1940 and 1950 Ray was King Rat of the Grand Order of Water Rats.